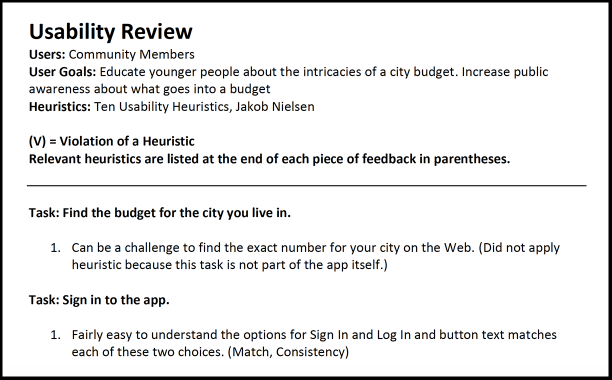 Work on a team to review the existing Austin Budget Party app and investigate ways that a newly developed similar app could be even more effective at helping people to learn about budgeting and policy decisions in their own city. 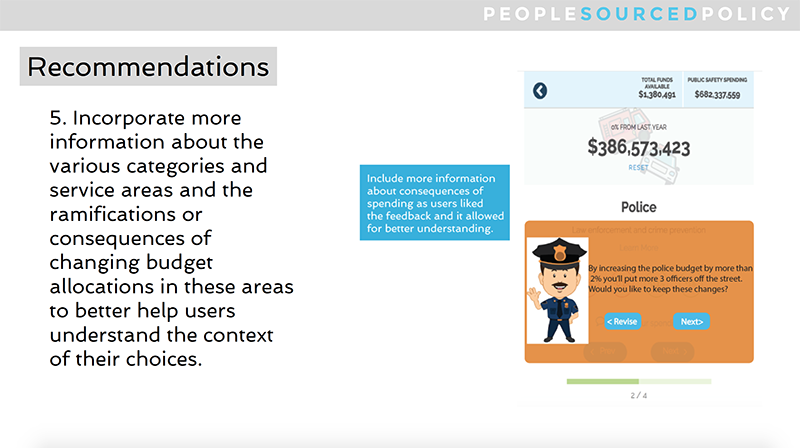 People Sourced Policy hopes to create an app that can be used by a variety of community members to help them learn about city budgeting and policy making. 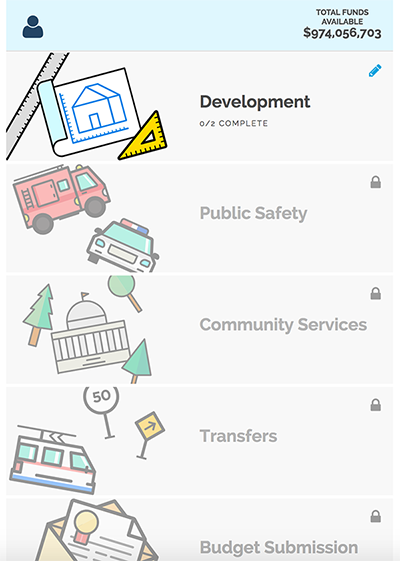 The Austin Budget Party app is intended to provide a way for middle school/junior high school students and other community members to understand how the Austin, Texas city budget is built. The budget is organized into several categories and users work their way through the app adding and subtracting money from the various categories to learn about the impact of their budgeting decisions. People Sourced Policy (PSP) hopes to create a new app based on the ideas presented through the Austin Budget Party app. One idea includes increasing versatility and usability of this new app by allowing users to enter their own city’s budget for any year. PSP would also like to use real numbers versus percentages in the new app and provide more feedback to users when completing the various categories. 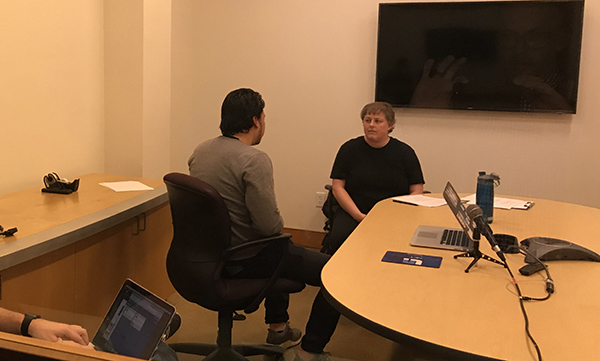 In order to gain a better understanding about the Austin Budget Party app, each team member performed a usability review to examine the app for possible usability concerns. We found through this initial review that there were several possible areas for improvement. Our findings were incorporated into a usability test plan document to organize the process of preparing for usability testing. User and client goals, user tasks, and scenarios were a part of this plan. Based on earlier analysis and changes initially suggested by the client, the group then developed a set of in print prototype pages to be used in the usability testing process. These prototypes were aimed at showing user and client-focused improvements and updates to the Austin Budget Party app. 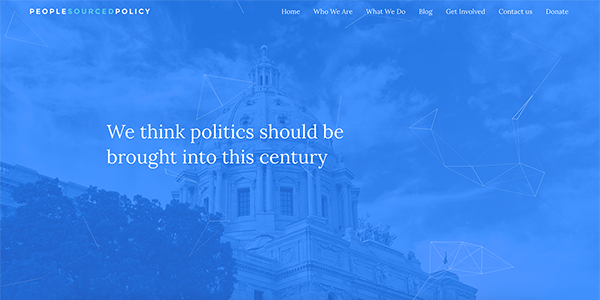 The improvements and updates were deemed to be desirable characteristics for a possible new app for People Sourced Policy. 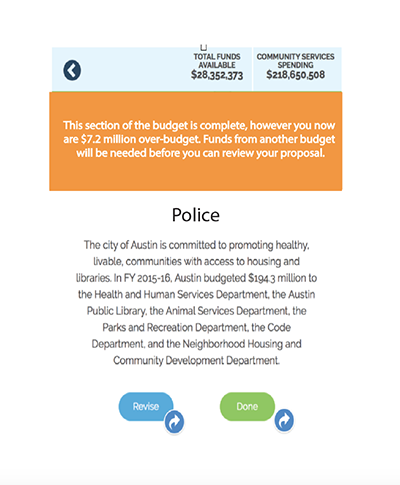 Because user testing would help gather responses to the existing Austin Budget Party app, as well as to the proposed changes in the prototype pages, our next step included in-lab and remote usability testing. Remote testing, using Appear.in and QuickTime, and in lab testing, using QuickTime, captured user responses. 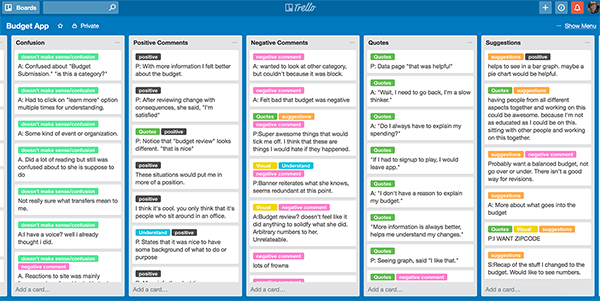 Notes were recorded in Trello for later organization and sorting. Throughout testing, users seemed to be looking for more information about how changes they made to the budget in the Austin Budget Party app affected the areas they changed. The prototype pages introduced more context and information about consequences related to increasing or decreasing the various budget areas. Users seemed to better understand the prototype pages with the additional information included. After all testing was complete, group members began sorting through all of the raw data collected. Several categories surfaced during raw data analysis and a few themes emerged from the testing. Along with the desire for more information and context based on their budgeting decisions, users expressed that real numbers would be easier to understand over percentages. Users also indicated that being able to explore all the categories from the start, rather than one at a time, would help increase their comprehension and improve decision-making behaviors. A final report was prepared outlining the findings from the analysis and testing. Recommendations tied to these findings were presented to the client in a final report.